Pour one out for Camino. The Mac-only browser, born a decade ago, is no longer under active development. Camino was a free, open-source browser for the Mac, built on Mozilla's Gecko engine. Unlike other Mozilla-based browsers of its era, Camino featured a totally native OS X interface from day one. By contrast, Firefox has long used a cross-platform interface markup language, which to this day makes some Mac users feel that the app isn't quite "Mac-like." First launched in February 2002 as Chimera, Camino started as a project within Netscape; it was originally created by Dave Hyatt, who went on to join Apple's Safari team later that year, where he remains today. (Hyatt also co-created Firefox.) Legal considerations later forced the name change to Camino. One of the Chimera/Camino project's co-founders was Mike Pinkerton, who became the project's lead when Hyatt left for Apple. Pinkerton later moved onto Google, where he worked on Camino in his "twenty-percent time." He also worked on Firefox, and is now part of the Chrome browser team. On Camino's website, a message announced the browser's end of life, saying that it "is no longer being developed, and we encourage all users to upgrade to a more modern browser." The page states that the browser is "increasingly lagging behind the fast pace of changes on the web, and more importantly it is not receiving security updates, making it increasingly unsafe to use." 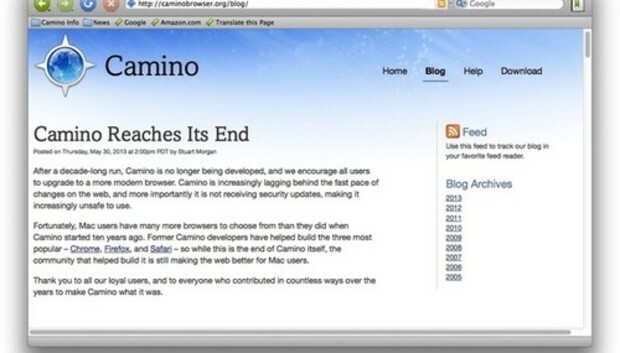 The page also reference's the Camino browser's impressive pedigree: "Former Camino developers have helped build ... Chrome, Firefox, and Safari," concluding that "the community that helped build [Camino] is still making the web better for Mac users." The final released version of the browser is 2.1, which is still available for download.